After much whining (and an exhaustive search), I have realized that however convenient it may be, I just cannot take photos of my projects that I like with my iPhone. Some people may be able to do it, I am just not one of them. I did have to search my house pretty thoroughly for my real camera, it was in hiding. 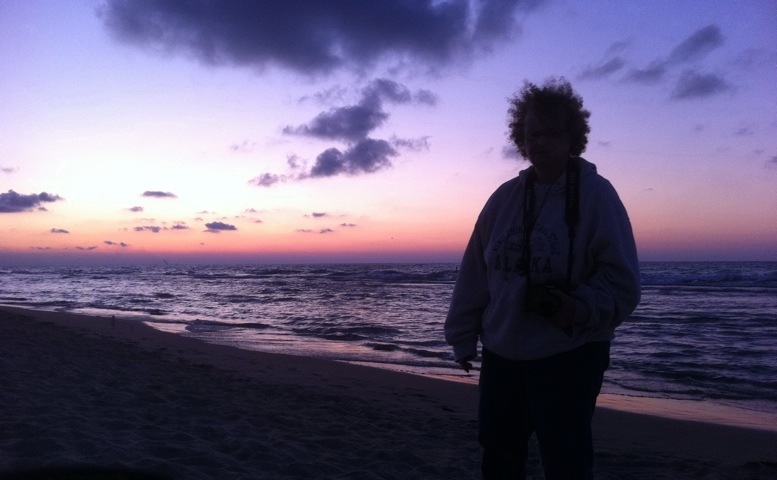 It is fairly old (Fujifilm FinePix), but it still takes good photos. I am much happier with the results for today. If you have been watching the news, you would have seen the massive cold weather system that tromped all over the Midwest yesterday and the extreme cold that has followed it. Due to this, my place of employment closed for the day and I have had a wonderful day at home, staying out of the cold. 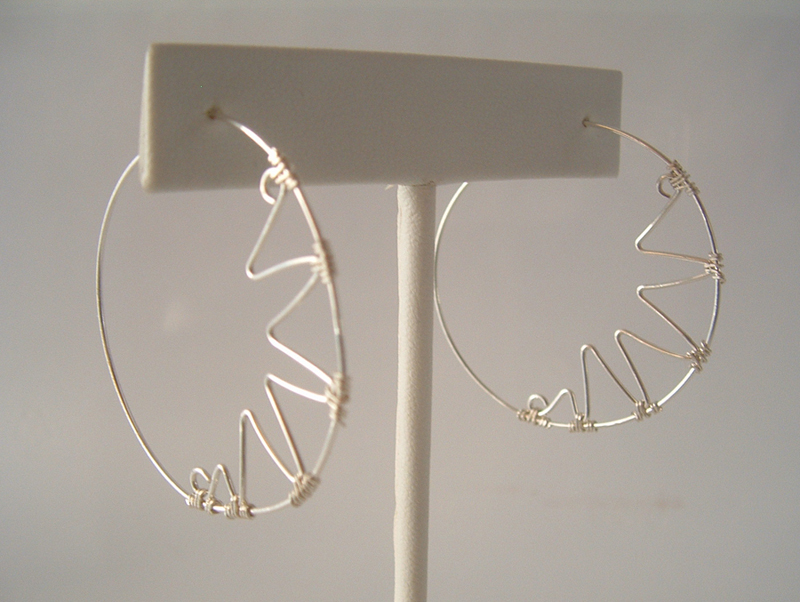 After a big breakfast and some lazing around, I made these wonderful hoop earrings with a zigzag in the center. I am really happy with how these turned out. They are made out of 21 gauge sterling silver wire. I wrapped the hoop around a mandrel to make the main frame of the earrings. 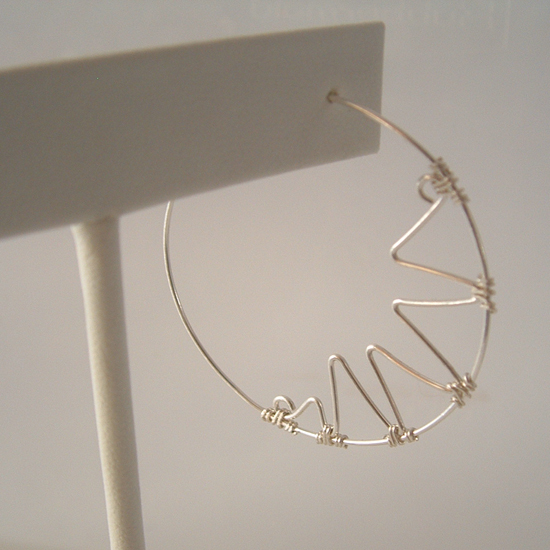 Then I used a 4″ piece of the same wire to make the zigzag which is connected to the hoop frame with 26 gauge sterling silver wire. After the zigzag was wrapped to the frame, I used a plastic mallet to harden the hoop and zigzag so that they wouldn’t get bent too easily. This is the creek flowing out of the wetlands. Lynne: My last post was about the beauty of the prairie on the farm, today, I want to post about the beauty of the wetlands on the farm. 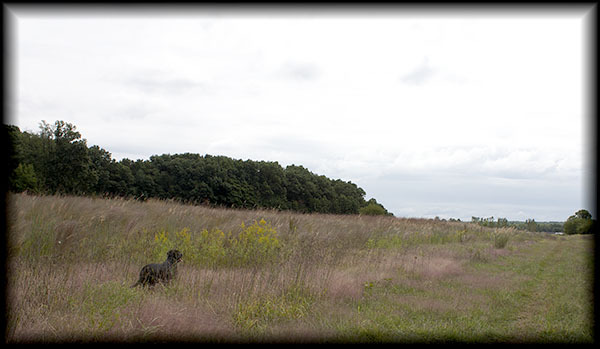 One of the best things about the farm, is the number of different habitats you can see. The wetlands are as wonderful as the prairie, but I like to look at them more than I like to walk in them. There are insects and snakes and sucking mud that make me careful about what I wear when I do go exploring. I put on those Wellingtons I spoke of the other day and resign myself to getting really dirty and really wet. 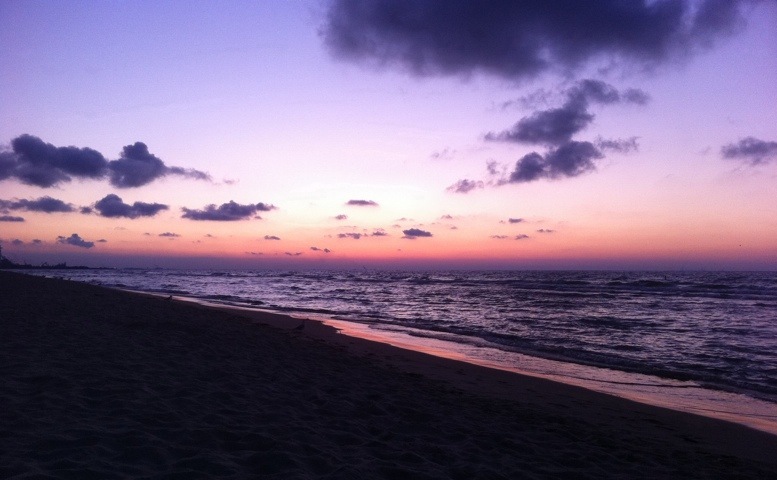 But there is so much to see, it is worth whatever it takes to get clean when you’re done. 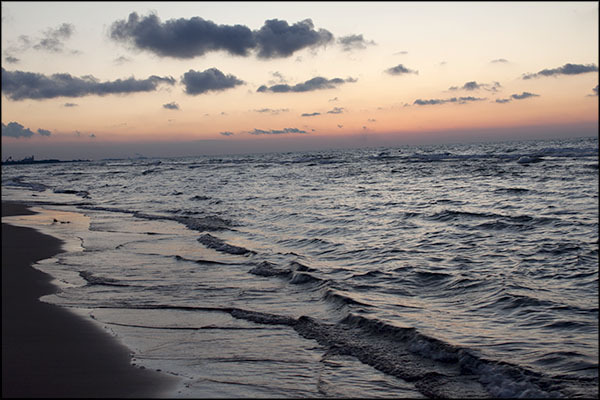 I think of it like swimming in cold water those first few days of summer, once you’re in you enjoy it so much you don’t want to get out. The photo above is of a stretch of creek that has already been filtered by the main, marshy areas and you can tell that the creek is running clear and swift. The bank of yellow flowers in the foreground is a showy clump of the pointy sticktights you find on your clothes and your dog after a walk. The creek is clear, because the wetlands have captured the silt and fertilizers that run off of fields and land cleared for building. 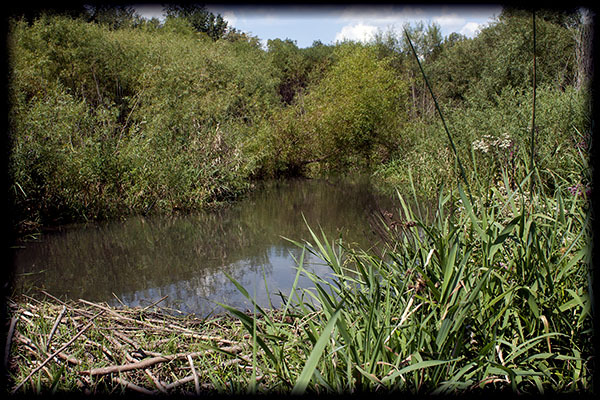 The marshy areas act like a sponge that absorbs this run-off before it is dumped into rivers and streams. The wetlands also act as areas of flood control as they absorb water during periods of flooding and release their water during periods of drought. 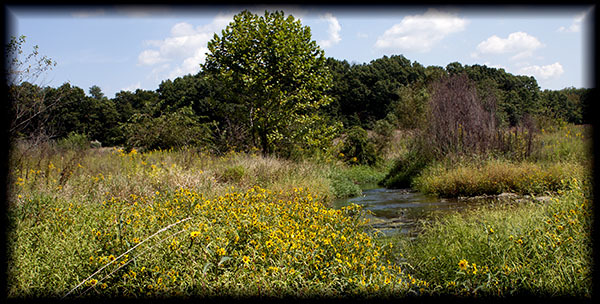 Purdue has a very informative webpage on wetlands and water quality, if you wish to know more. The start of a pond behind the beaver dam. 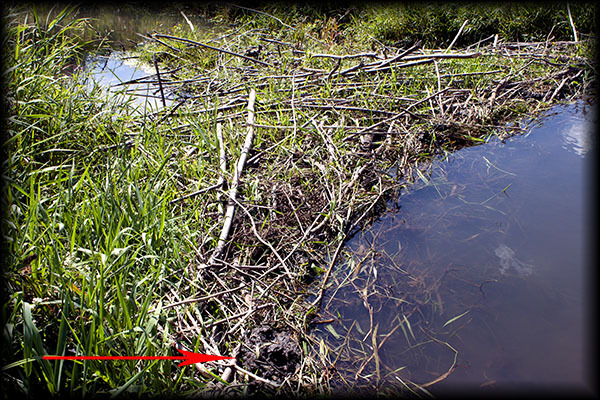 These two photos show a beaver dam. Footprints and the more telltale tooth-cut logs and branches helped us discover it. The Great Plains Nature Center has great photos of beaver and their chewing habits. Water is dammed and pools behind the dam create more beneficial marshy areas. However, wetlands change quickly because of their response to the weather. A beaver dam today is not a beaver dam tomorrow and ‘busy as a beaver’ has meaning when you have to repair or start over whenever a big storm passes through. 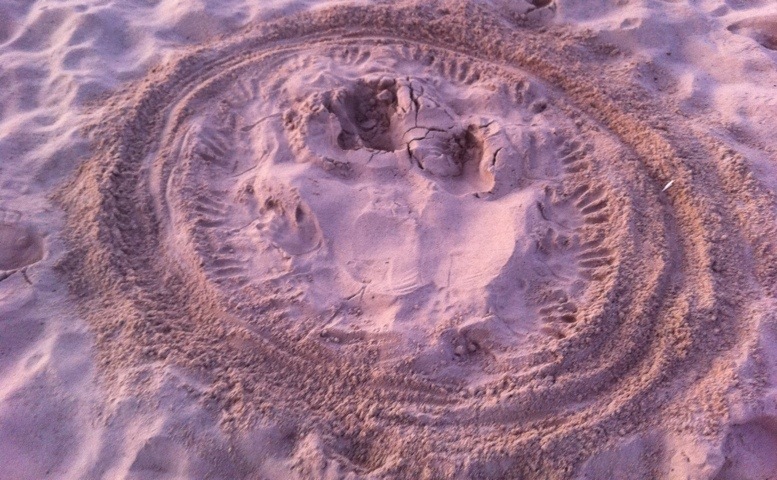 Beavers have been working like beavers and left a telltale print. Now that I think about it, maybe I do like the wetlands better than the prairie. Oh wait, I haven’t posted about the woods yet or the pond. Well, I guess I don’t have to worry about which is best…If you can’t choose which one you love, love the one you’re with. 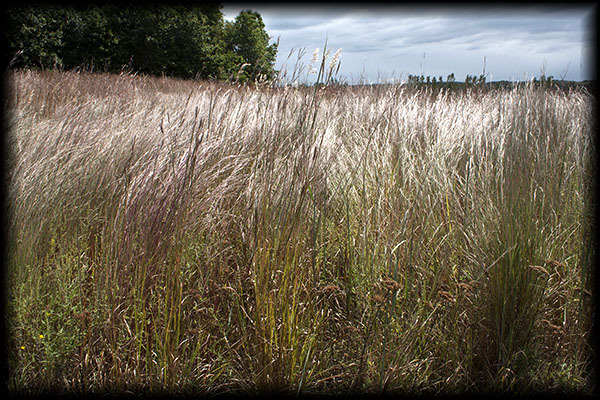 Lynne: This afternoon at the farm, I looked to the north at the fields of wild grasses and was surprised by a mass of yellow. The goldenrod is in bloom. When goldenrod blooms all the insects know that frost is not far behind and all the bees and butterflies and insects can be found with their snouts buried in the pollen. Since all those creatures were busy with the goldenrod, I thought it would be a good time to get some of those interesting closeup photographs of tiny creatures. I rode out in the Mule (machine type Kawasaki not 4 legged type animal) and stopped near the edge and put my finger to the shutter release. 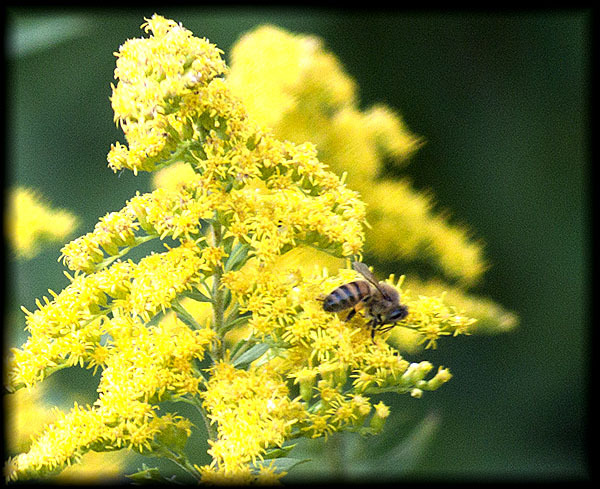 There were so many insects on the goldenrod that I wanted a picture of them all, but these two pictures with the bees show the rich heavy pollen and the bees’ determination to gather it even with a nosey photographer and her camera too close for comfort. 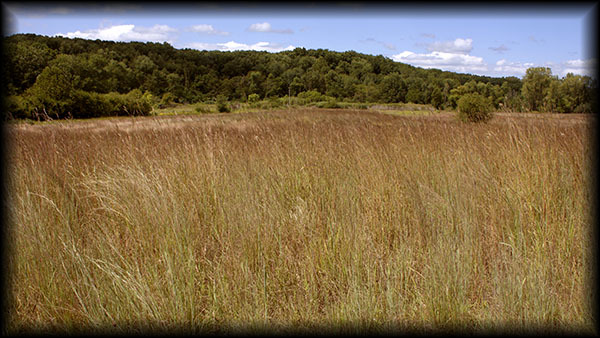 I sneezed for a while afterwards and I blamed the goldenrod, but I found this website, The Great Plains Nature Center, and learned a great deal of information about the flora and fauana of prairies. 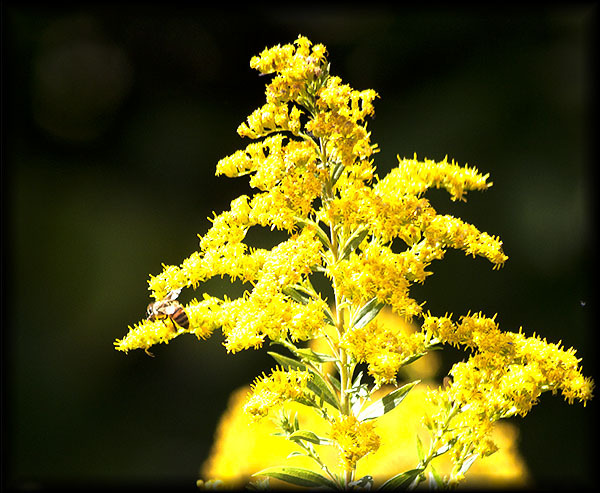 Goldenrod is not the culprit of fall allergies. Its pollen is thick and sticky to attach itself to the insects that pollinate it. Ragweed is the culprit because it pollinates with the wind by releasing millions of grains of pollen into the air and into your nose. Ragweed is green and fades into the late summer foilage, but goldenrod stands proud and yellow. Guess who gets the blame for allergies. Next time you see a field of blooming goldenrod, take the time to thank the land owner who is willing to allow weeds to grow. Weeds are only plants that humans have not found a way to make money from, but to the insects and birds those same weeds are their super Walmart and discount shopping mall all rolled into one. Hummingbirds posturing in the air. Eventually, the lure of the sugar overcomes all the belligerence. Hummingbirds seem like such sweet birds. After all, they live on sweet nectar and sugar water, but…they are vicious little buzzers screeching and shoving each other with sweetness only on their beaks and never in their hearts. 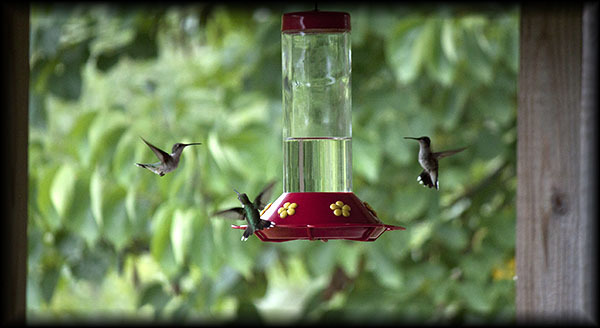 The farm is a great place to watch hummers. I have counted as many as 75 of them at a time among the flowers and feeders. The air is loud with the hum of their wings and their shrieks of fury as one of them occupies the space another wishes were his. 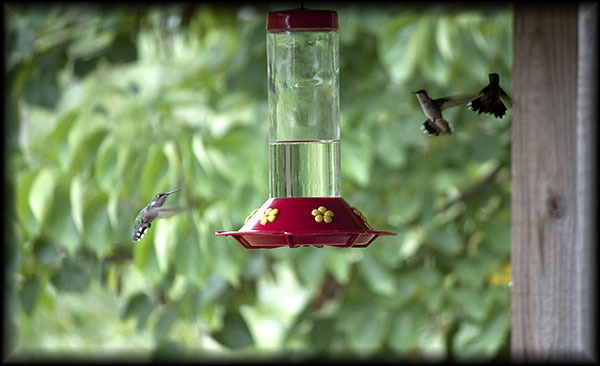 There is little peace where hummers gather, but then peaceful is not nearly as amusing. Air traffic control to fliers: "Your are buzzing into the path of oncoming traffic! Evade, evade..."
Mid air refueling. It's a tricky business. 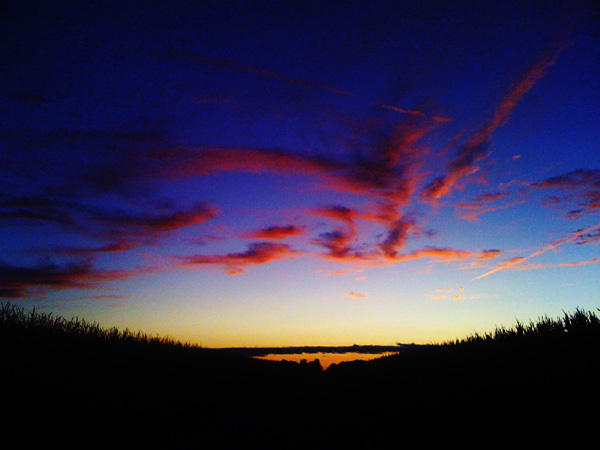 There was an interesting sky over the cornfields as I came up Highway 29 tonight. I was practically standing in a field to get the photo. 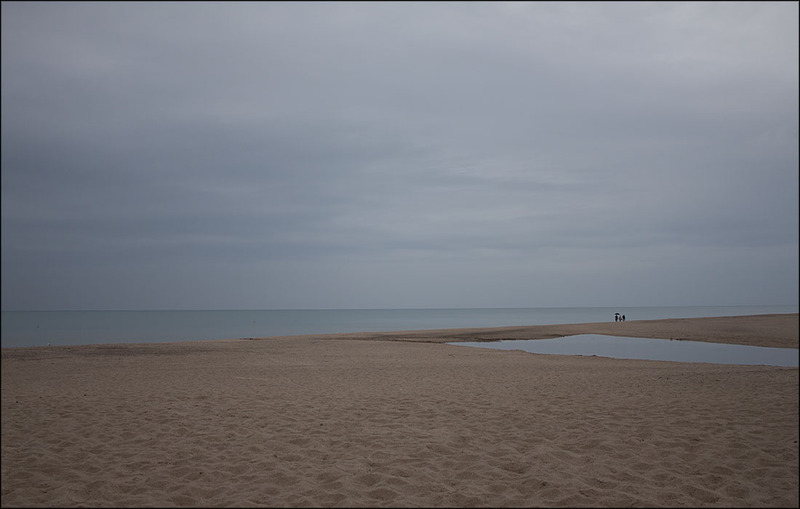 I did play with curves in Photoshop a bit when processing this photo. What do you think? 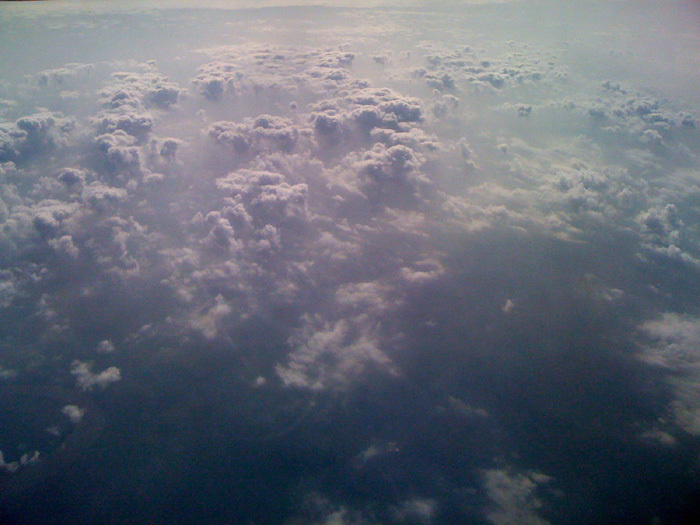 I took this picture while flying to Daytona one afternoon, so you’re seeing the clouds from above. 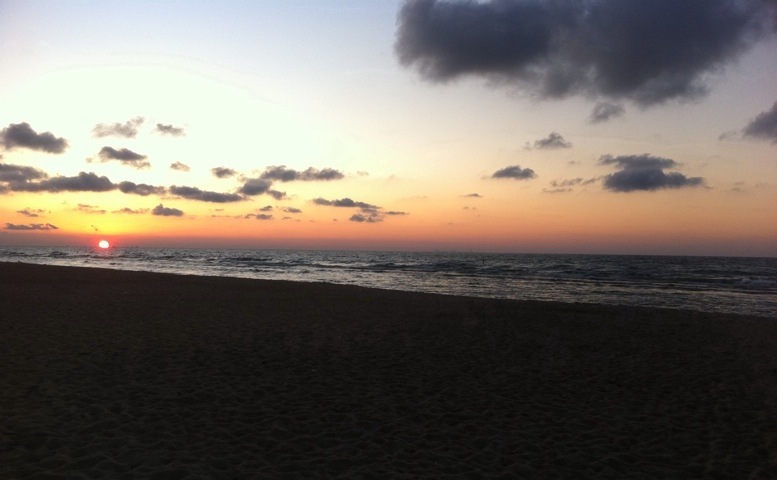 It’s not quite a sunset, but so pretty that I wanted everyone to see it.